Packing perfection is stemmed in good intentions. We want everything to be arranged neatly. There are few pleasures that match a neatly-arranged space with no wasted space. That might help explain the appeal of Tetris, in some roundabout way, because there’s a psychological element to having things tidied up. It might be after a long day of work, so we can see the results of our efforts, and reflect with confidence that we will change and that the clutter we had was just temporary. Unfortunately, my mind has still drifted to a cluttered physical space; it’s just I’ve become more aware of clutter, which is a good start. How do we shatter our clutter and perfection states? My clutter in one area starts when I’m working in another area. I’ll place paperwork near where they should go, on an empty surface, then keep going. Once that area is clear, something will distract me, and I won’t return to the paperwork placed almost improperly, and then the next day or next week, I’ll look at my laptop’s workspace and it’ll take a few minutes before I can unearth it. Similarly, we might get lazy when we’re alphabetically ordering our CD collections, or we might not catalog a CD or ten at all, leading to haphazard arrangements. The trick might be not spending too much time decluttering. I have to unlearn the hoarding mentality completely to declutter and move as soon as possible. Even there, there are breathing room moments. There’s enough to do throughout the entire living space that if I don’t feel like doing anything overly physical, I can do some logical arranging, take care of some chores while imagining what I need to do next or even practice some detachment techniques to stop obsessing over physical objects so much. These all progress the moving process, but it’s important to not overly indulge in daydreaming a perfect outcome. Right now, it’s important to focus on good enough. 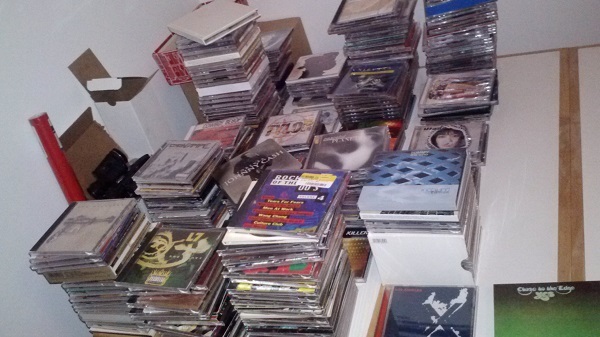 If I can roughly imagine where disparate collectible items are located, I can hold off on packing them up, just like I can hold off on packing CDs from the same band until I’ve collected up the discography, but if I didn’t catalog a certain CD, there’s no point going back to the box that’s already completely full of CDs just to reunite the lost CD – at this point. Make a note and move on. After I’ve moved, I can do that, but now is not the time. Learning this has sped up my moving process somewhat significantly. Inspirations: After a day spent clearing out the CDs I have heard, and a week spent clearing out the stuff I want to keep, I’m closer to the remaining stuff that I both don’t care about and do. Now is not the time to look back on any certain decisions or try to unpack anything. Just as a side note, I’m really proud of the progress I’ve made in around one month. This essay doesn’t publish for a few months yet, but the amount of stuff I’ve packed up is striking. 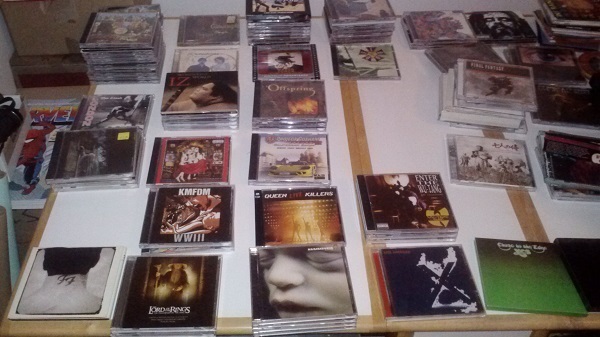 Photos: A previous attempt at alphabetizing my collection. The photo doesn’t quite relate to this essay, except maybe that at the time I took these photos, I was too focused on precisely cataloging everything.